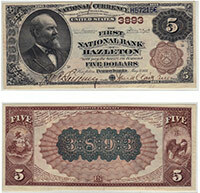 We specialize in valuing and buying three types of rare paper money. These were printed by national banks between 1862 and 1935. We are experts in this field. We buy and sell hundreds of nationals on an annual basis. Please visit our national bank note guide. This type of paper money was printed by the United States between 1861 and 1923. Some of these notes can be very rare and sell for thousands of dollars. Please visit our large size guide. This is a popular area. We focus on the rare issues from 1928 and 1934. We are especially fond of low serial numbers and high grade examples. Please visit our guide about rare star notes.